The purpose of our study is to explore the efficiency of Shear Wave Elastography (SWE) in predicting malignancy Breast Cancer (BC). 63 patients with normal mammary glands and 61 patients with invasive carcinoma were detected by Real-time Tissue Elastography (RTE). Two SWE images of breast hyperplasia with fibroadenoma and invasive breast carcinoma were also obtained. For the SWE characteristics, maximum, minimum, mean elasticity and SWE ratio were acquired. The SWE ratio was counted to reflect the stiffness of lesions, and a high ratio demonstrated a stiff lesion. Kruskal-Wallis one-way ANOVA, Receiver Operating Characteristic (ROC) curve, and Z-Test were used for statistical analysis. Our results indicated that SWE in patients with normal mammary glands showed a light-blue coloured lesion and the SWE values (Emean) was 7.1 kPa. SWE in patients with invasive carcinoma revealed a yellow-to-red coloured mass, and the SWE values (Emean) was 243.6 kPa. The cut-off values of the ROC curve analysis at lesion (Emax) and gland ratio (Erat) were 55.8 kpa and 3.45. The Z value was 0.915, and the P value was 0.36 for ROC curve between Emax and Erat. The SWE value (Emean) in front of the fat layer was 12.6 kPa in patients with breast hyperplasia accompanying fibroadenoma. The SWE values (Emean) in front of the fat layer was 23.9 kPa in patients with invasive carcinoma. Breast cancers with invasive characteristics had high SWE ratios. Therefore, SWE may provide potential application value for predicting prognosis. Breast Cancer (BC) is identified to be the most common cancer and the principal cause of cancer death among females worldwide . In 2015, cancer was accounting for 429.16 million new cases and 281.42 million deaths in the China, among them, BC accounted of 2.47% in deaths with 69.5 million cases. Despite the enormous progress of novel treatments in recent few decades, the five-year relative survival rates of BC with I, II, III and IV, 5 y survival rate of BC were 80%, 52%, 42% and 14%, respectively [2,3]. The high incidence and poor prognosis of BC are mainly due to the lack of effective measures of diagnosis and treatment, and patients are often at advanced stages when are diagnosed [1,4]. The current therapies for patients who suffered from BC are mainly including chemotherapy and radiotherapy, with very limited therapeutic efficacy and even along with several unexpected side effects [5-7]. Therefore, it is particularly important for the early diagnosis and identification of BC. Human tissue lesion has a direct relationship with its hardness changes . Palpation have been widely applied in clinical practice, the hardness of palpation is of great significance to the differential diagnosis of benign malignancy. However, palpation is highly dependent on the doctor’s subjective experience . It is difficult to detect the deep lesions and early minor lesions. Therefore, it has become the focus of research to assess the hardness of the lesion objectively in recent years. At present, many methods of elastography are available on many current ultrasound systems. While individual images can be interpreted consistently, it can be difficult to capture the same information across acquisitions or users, and this may hamper clinical utility [10-12]. Real-time Shear Wave Elastography (SWE, Supersonic Imagine, Aix-en-Provence, France) serves as an acoustic pressure wave which contains slow-moving lateral waves, and the speed of the shear wave is related to the square root of the tissue’s elastic modulus . Shear wave is spread more slowly in soft tissues and faster in hard tissues. UltrafastTM imaging can detect the small changes according to the different stiffness of tissues. Therefore, Real-time SWE is a real-time, reliable, and reproducible manner to make physicians to visualize and quantify the stiffness of tissues. Above all, realtime SWE has lots of advantages, such as real-time guidance using two-dimensional image; The visual display using color elastic image; The repeatability and safety operation and the quantitative analysis using the absolute value of Young’s modulus. Therefore, the elastic modulus value of breast solid lesions is of great significance in the evaluation and differential diagnosis of benign and malignant breast solid lesions. Contrasted with the other elastic modulus value, the Eratio and the Emax have greater diagnostic value. In our study, patients with normal mammary glands, invasive carcinoma, breast hyperplasia with fibroadenoma, and invasive breast carcinoma were detected by Real-time Tissue Elastography (RTE), and the maximum, minimum, mean elasticity and SWE ratio were acquired. We then analyzed the Emean value in patients with normal mammary glands before and after 40 y of age. In patients with BC, we drew the ROC curves of Emax and Eratio, and concluded the critical values both them to identify its value in terms of disease diagnosis. The study was approved by the Ethics committee of the Hospital. Each patient has provided the informed consent before enrolment. We chose 63 patients that have mammary glands of ultrasound without exception, and 63 breast lesions including 23 malignant lesions and 40 benign lesions. All patients were scanned using the Aixplorer ultrasound system (SuperSonic Imagine, Aixen Provence, France) in the Hospital between 2013 and 2016. 63 patients had been scheduled for US-guided core biopsy or surgical excision. The features of sonographic images including lesion’s shape, margin, echo, height/width, halo, acoustic shadow, flow, which were classified according to the American College of Radiology (ACR) Breast Imaging Reporting and Data System (BI-RADS). All SWE pictures were freely provided to participants. According to the medical records and breast ultrasound, we established the inclusion criteria. We included women with a breast mass revealed with palpation, mammography. We excluded women with breast implants and those who were pregnant or lactating, who were receiving chemotherapy or radiation therapy for any cancer, who had a history of ipsilateral breast surgery, or who were unwilling or unable to provide informed consent were excluded. Women who have skin lesions and lesions that had been biopsied previously were also excluded. In our study, all investigators major in BC diagnosis independently accomplished at least 150 breast ultrasound examinations in a year. All participants have accepted the breast ultrasound with breast ultrasound system. On the basis of the ultrasonic breast mass BI-RADS taxonomy made by the radiological society of the United States in 2003 (American College of Radiology, ACR), we chose breast masses of BIRADS classification for 3, 4a, 4b, 4c and 5 classes . Qualified participants will receive additional B-mode ultrasound examination with the ultrasound system (RUBI, Supersonic Imagine, Aixen-Provence, France), and B-mode characteristics were recorded. After the completion of all identification, SWE was performed with the frequency probe at 4-15 MHz and then we acquired three separate images in SWE mode. According to the shape of the breast masses, the entire lesion area was covered as far as possible, and then the QBOXTM function was started to measure the Emax, Emean, Esd values. We then selected the hardest area of the diseased tissues (2 mm × 2 mm, circular region) and normal breast tissues at the same depth (2 mm × 2 mm, circular region), and then used Q-BOXTM function to detect the ratio of Emax. Investigators will evaluate the three qualitatively similar images, and analyze the quantitative SWE characteristics of the mass. Investigators will also carry out a blinded evaluation for the static images of all masses. The continuous variables in this study were dichotomized (for example, normal breast tissues were dichotomized into before and after 40 y old. BC patients were dichotomized into patients with benign tumors and patients with malignant tumors. Lesions were dichotomized into malignant lesions and benign lesions). The significance of differences was assessed using the Chi-square test. The quantitative values maximum elasticity (Emax), median elasticity ratio (Erat), median mean elasticity value (Emean), and minimum elasticity (Emin) were collected on SWE. SWE, B-mode, and clinical characteristics were counted statistically between benign and malignant lesions using a Student’s t-test or Kruskal-Wallis one-way ANOVA. The Receiver Operating Characteristic (ROC) curve was also drawn, the area under the ROC curve (Area under Curve, AUC) was calculated, and the optimal critical value of diagnosis was obtained, the sensitivity and specificity were calculated. The data were analyzed using IBM SPSS 21 (IBM, Portsmouth, UK). The area under the ROC curve for The SWETM (Emax and Erat) was analyzed by Z-test. The statistical significance was set at P<0.05. SWE imaging technology was firstly used to carry out elasticity quantitative study on normal breast tissue and find the hardness range of normal breast tissue so as to provide the basis for the further abnormal disease diagnosis. We chose 63 patients that have mammary glands of ultrasound without exception. 63 patients were divided into two groups according to age before and after 40 y of age. Then 63 patients with normal mammary glands were detected by Real-time Tissue Elastography (RTE). As shown in Table 1, the median mean elasticity values (Emean) were 10.925 ± 4.354 and 12.683 ± 4.335 in 63 patients with normal mammary glands before and after 40 y of age (t=0.169, P=0.866), and the glandular section thickness (cm) were 0.979 ± 0.290 and 0.964 ± 0.386 in 63 patients with normal mammary glands before and after 40 y of age (t=-1.596, P=0.116). The images of all patients were very similar. As shown in Figure 1 (Top), the results indicated that SWE showed a light-blue coloured lesion, and the SWE values (Emean, Emin, Emax and Esd) were 7.1 kPa, 5.5 kPa, 9.3 kPa and 0.7 kPa. B-mode image (Bottom) showed an ill-defined, hypoechoic mass. *E mean=median mean elasticity value. Table 1: The median mean elasticity value (Emean) of normal breast tissues before and after 40 y of age. Figure 1: Two shear wave elastography (SWETM) images of normal breast and invasive carcinoma. (A) 63 patients with normal mammary glands were detected by real-time tissue elastography (RTE). The images of all patients were very similar. SWE (top) showed a lightblue coloured lesion, Emax was 9.3 kPa, Emean was 7.1 kPa, Emin was 5.5 kPa, Esd was 0.7 kPa. B-mode image (Bottom) showed an illdefined, hypoechoic mass; (B) 61 patients with invasive carcinoma were measured by RTE. The images of all patients were very similar. SWE (Top) revealed a yellow-to-red coloured mass. The red showed the highest stiffness and the blue showed the lowest stiffness, Emax was 298.1 kPa, Emean was 243.6 kPa, Emin was 161.8 kPa, Esd was 40.8 kPa, Erat was 72.4. B-mode image (Bottom) revealed an illdefined, hypoechoic mass. Emax indicates maximum elasticity, Emean indicates median mean elasticity value, Emin indicates minimum elasticity, Esd indicates standard deviation of elasticity, Erat=median elasticity ratio. The 63 breast lesions in our study cohort were 23 malignant lesions and 40 benign lesions. 23 malignant lesions included invasive carcinoma (n=15), intraductal carcinoma (n=6), preinvasive carcinoma (n=2); 40 benign lesions included fibroadenoma (n=18), breast hyperplasia (n=12), intraductal papilloma (n=2), and other (n=8) (Table 2). Table 2: The pathological situation of 66 breast cancer patients. 61 patients with invasive carcinoma were measured by RTE. The images of all patients were very similar. As shown in Figure 1 (Below), the results revealed a yellow-to-red coloured mass. The red showed the highest stiffness and the blue showed the lowest stiffness, and the SWE values (Emean, Emin, Emax, Esd and Erat) were 243.6 kPa, 161.8 kPa, 298.1 kPa, 40.8 kPa, and 72.4 kPa. B-mode image (Bottom) revealed an illdefined, hypoechoic mass. According to statistics, the lesion (Emax) in benign tumors (n=40) and malignant tumors (n=23) were 20.973 ± 7.308 and 82.259 ± 41.370 (t=-7.042, P<0.01). The gland ratio (Erat) in benign tumors (n=40) and malignant tumors (n=23) were 1.588 ± 0.543 and 5.260 ± 2.190 (t=-7.902, P<0.01). The surrounding parenchyma (Emean) in benign tumors (n=40) and malignant tumors (n=23) were 10.956 ± 3.737 and 15.639 ± 5.607 (t=-3.575, P<0.01) (Table 3). *Emax=Maximum elasticity; Erat=Median elasticity ratio; Emean=Median mean elasticity value. Table 3: The elastic mould values in benign tumors and malignant tumors. The cut-off value of the ROC curve analysis at Emax was 55.8 kpa, and the area under the receiver operating characteristic curve (AUC) was 0.963 with a sensitivity of 91.3% and specificity of 95.0% (Figure 2). And then the diagnosis of ROC curve was analyzed according to the cut off points (Emax=55.8 kpa). The number of malignant lesions was 21, and the number of benign lesions was 2 in patients with malignant tumors (n=23). The number of malignant lesions was 2, and the number of benign lesions was 38 in patients with benign tumors (n=40). The number of total malignant lesions was 23, and the number of total benign lesions was 40 (Table 4). Therefore, when the cut off points for Emax was 55.8 kpa, the accuracy was 93.7%, the positive predictive value was 91.3%, and the negative predictive value was 95.0% (Table 6). Table 4: The diagnosis of ROC curve according to the cut off points (Emax=55.8 kpa). Figure 2: ROC curves for lesion (Emax). The chosen cut-off value was 55.8 kpa, the area under the receiver operating characteristic curve (AUC) was 0.963. Emax indicates maximum elasticity. 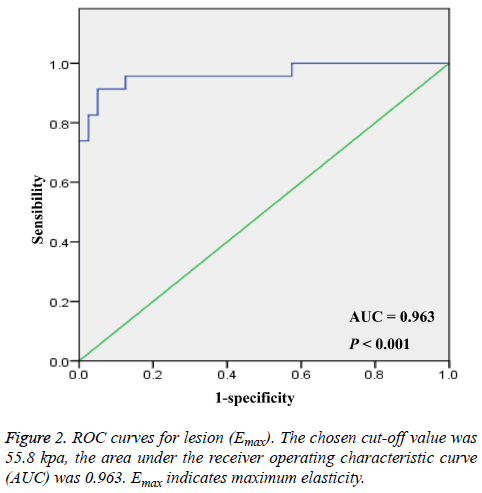 The cut-off value of the ROC curve analysis at Erat was 3.45, and the area under the receiver operating characteristic curve (AUC) was 0.948 with a sensitivity of 91.3% and specificity of 92.5% (Figure 3). Then the diagnosis of ROC curve was analyzed according to the cut off points (Erat=3.45). The number of malignant lesions was 21, and the number of benign lesions was 2 in patients with malignant tumors (n=23). The number of malignant lesions was 3, and the number of benign lesions was 37 in patients with benign tumors (n=40). Figure 3: ROC curves for gland ratio (Erat). The chosen cut-off value was 3.45, the area under the receiver operating characteristic curve (AUC) was 0.948. Erat indicates median elasticity ratio. The number of total malignant lesions was 24, and the number of total benign lesions was 39 (Table 5). Therefore, when the cut off points for Erat was 3.45, the accuracy was 92.1%, the positive predictive value was 87.5%, and the negative predictive value was 94.9% (Table 6). ROC curves for lesion (Emax) and gland ratio (Erat). Table 5: The diagnosis of ROC curve according to the cut off points (Erat=3.45 kpa). *Emax=Maximum elasticity; Erat=Median elasticity ratio. Table 6: Diagnostic performance characteristics: Comparison Lesion (Emax) and Gland ratio (Erat). In addition, the area under the ROC curve for The SWETM (Emax and Erat) was analyzed by Z-test. The results indicated that the Z value was 0.915, and the P value was 0.36 for ROC curves between lesion (Emax) and gland ratio (Erat), suggesting that the diagnostic value of breast lesions diagnosis was high. There was no obvious difference for the area under the ROC curve (Figure 4). Figure 4: ROC curves for lesion (Emax) and gland ratio (Erat). Area under the ROC curve for The SWETM (Emax and Erat) was analyzed by Z-test (P value=0.36, Z value=0.915). Emax indicates maximum elasticity; Erat indicates median elasticity ratio. Studies revealed that adipose tissues can cause abnormal ultrasonic phenomenon, such as cloudy, fuzzy, etc. When breast lesions infiltrate into subcutaneous fat layer [15,16]. We then detected patients with breast hyperplasia accompanying fibroadenoma using RTE. The images of all patients were very similar. As shown in Figure 5 (Top), the results showed that SWE showed a light-blue coloured lesion, and the SWE values in front of the fat layer (Emean, Emin, Emax, and Esd) were 12.6 kPa, 12.3 kPa, 13.0 kPa, 0.3 kPa. Figure 5: Two SWE images of breast hyperplasia with fibroadenoma and invasive breast carcinoma. (A) Patients with breast hyperplasia accompanying fibroadenoma were detected by RTE. The images of all patients were very similar. SWE values in front of the fat layer were count (Emax was 13.0 kPa, Emean was 12.6 kPa, Emin was 12.3 kPa, Esd was 0.3 kPa); (B) Patients with invasive carcinoma were measured by RTE. The images of all patients were very similar. SWE values in front of the fat layer were count (Emax was 27.9 kPa, Emean was 23.9 kPa, Emin was 17.5 kPa, Esd was 2.6 kPa). B-mode image (Bottom) showed an ill-defined, hypoechoic mass. We also found that the echo change in benign lesions surrounding adipose tissues was that fiber connective tissues were close when local fat was extruded. In addition, patients with invasive carcinoma were measured by RTE. The images of all patients were very similar. The SWE values in front of the fat layer (Emean, Emin, Emax, and Esd) were 23.9 kPa, 17.5 kPa, 27.9 kPa, 2.6 kPa. The results also showed the echo changes in malignant lesions surrounding adipose tissues, such as stromal reaction caused by tumor cells; Fibrous tissue hyperplasia in the edge of lesion of subcutaneous tissues with more fibroblasts, neutral particles, and lymphatic; Direct infiltration of cancer cells in segmental adipose tissues (Figure 5, Below). At present, it is an effective method for detection of BC to use breast ultrasound combined breast X-ray examination and other breast imaging method, but its specificity is relatively low [17-19]. Because many benign tumors are relatively soft, malignant tumors are relatively rigid, at the same time, elasticity imaging method can imaging tissue stiffness, so elastography can improve the examination level of patient masses with a low index of suspicion on B-mode ultrasound [20,21]. Many elasticity imaging methods are available on various ultrasound systems, because many of them rely on deformation of tissues, such as strain, the release of pressure, hand pressure, using the breathing exercises or heart movement . However, it’s hard to get the same information, which may affect the clinical utility [11,12]. Real-time SWE has been considered to be another useful detection method for the clinical management of patients compared with grayscale ultrasound in benign/malignant differentiation of solid masses [11,12,22]. In addition, stiffness on SWE was also related to tissue signatures, such as tissue grade, size, and nodal stage [23-25]. Therefore, Real-time SWE also can be used to quantitatively analyze the BC tissue stiffness, and provide more abundant information for the diagnosis of breast disease. We aimed to assess the application value of different elastic modulus value using real-time SWE technology in differentiating benign and malignant breast solid lesions. In our study, we found that SWE in patients with normal mammary glands showed a light-blue coloured lesion. SWE in patients with invasive carcinoma revealed a yellow-to-red coloured mass. There were statistical significances for the lesion (Emax) in benign tumors and malignant tumors; the gland ratio (Erat) in benign tumors and malignant tumors; the surrounding parenchyma (Emean) in benign tumors and malignant tumors. Our results revealed that many types of breast tissues have similar SWE features, lobular cancers have similar stiffness. The variation trend for Emean value was not in conformity with the previous researches in 63 patients with mammary glands before and after 40 y of age. The reasons of discrepancy were that participants are mostly in growth period with concentrated age, and the hormonal changes of participants may affect the changes of breast elastic stiffness. For 61 patients with invasive carcinoma, we found that there were rich blood vessels in malignant lesions around; the tumor epithelial cells were mainly located in the edge area, the infiltrating glands and adipose tissues. In addition, we found that SWE in patients with breast hyperplasia accompanying fibroadenoma indicated a light-blue coloured lesion with 12.6 kPa Emean. The results also indicated that the echo change in benign lesions surrounding adipose tissues was that fiber connective tissues when local fat was extruded. SWE in patients with invasive carcinoma revealed a yellow-to-red coloured mass with 23.9 kPa Emean. The results also showed that the echo changes in malignant lesions surrounding adipose tissues, such as stromal reaction; fibrous tissue hyperplasia in the edge of lesion of subcutaneous tissues with more fibroblasts; the infiltration of cancer cells in segmental adipose tissues. Therefore, SWE ratios were closely associated with the degree of BC metastasis. Receiver Operating Characteristic (ROC) analysis is a common graphical analysis technology of classification models [26,27]. ROC analysis is widely used in various fields, such as bioinformatics, medical statistics, radiology, pattern recognition, and machine learning, etc. [28-30]. In addition, some indicators from ROC curve, such as the area under the ROC curve (AUC) has been used as evaluation and construction of classifiers [31,32]. In our study, the chosen cutoff value of Emax was 55.8 kpa. The area under the AUC was 0.963. The chosen cut-off value was Erat 3.45 kpa. The area under the AUC was 0.948. Area under the ROC curve for The SWETM (Emax and Erat) was analyzed by Z-test (P value=0.36, Z value=0.915). The data indicated that the diagnostic values of diagnosis were high both Emax and Erat in breast lesions. In conclusion, our results indicated that mammary gland can be used as a reference Eratio value; The Z value was 0.915, and the P value was 0.36 for ROC curves between E max and E rat, indicating that the diagnostic value of breast lesions diagnosis was high; When Eratio value exceeded 3.45 or Emax exceeded 55.8kPa, SWE has higher diagnostic accuracy and specificity. Therefore, real-time SWE can be used to detect the micro vascularization in different lesions, which will provide new clinical information and diagnostic values in benign and malignant lesions. Supported by Education Agency of Zhejiang Province, P. R. China (No. Y201534607) and Health Bureau of Zhejiang Province, P. R. China (No. 2017195594). Chen W, Zheng R, Baade PD, Zhang S, Zeng H, Bray F, He J. Cancer statistics in China, 2015. CA Cancer J Clin 2016; 66: 115-132. Ording AG, Boffetta P, Garne JP, Nystrom PM, Cronin-Fenton D, Froslev T, Lash TL. Relative mortality rates from incident chronic diseases among breast cancer survivors-a 14 year follow-up of five-year survivors diagnosed in Denmark between 1994 and 2007. Eur J Cancer 2015; 51: 767-775. French Adjuvant Study Group. Benefit of a high-dose epirubicin regimen in adjuvant chemotherapy for node-positive breast cancer patients with poor prognostic factors: 5-year follow-up results of french adjuvant study group 05 randomized trials. J Clin Oncol 2001; 19: 602-611. Burstein HJ, Lacchetti C, Griggs JJ. Adjuvant endocrine therapy for women with hormone receptor-positive breast cancer: American society of clinical oncology clinical practice guideline update on ovarian suppression summary. J Oncol Pract 2016; 12: 390-393. Coates AS, Winer EP, Goldhirsch A, Gelber RD, Gnant M, Piccart-Gebhart M, Panel M. Tailoring therapies-improving the management of early breast cancer: St Gallen international expert consensus on the primary therapy of early breast cancer 2015. Ann Oncol 2015; 26: 1533-1546. Goldhirsch A, Winer EP, Coates AS, Gelber RD, Piccart-Gebhart M, Thurlimann B, Panel M. Personalizing the treatment of women with early breast cancer: highlights of the St Gallen international expert consensus on the primary therapy of early breast cancer. Ann Oncol 2013; 24: 2206-2223. Milly H, Festy F, Andiappan M, Watson TF, Thompson I, Banerjee A. Surface pre-conditioning with bioactive glass air-abrasion can enhance enamel white spot lesion remineralization. Dent Mater 2015; 31: 522-533. Zimmermann N, Ohlinger R. Diagnostic value of palpation, mammography, and ultrasonography in the diagnosis of fibroadenoma: impact of breast density, patient age, ultrasonographic size, and palpability. Ultraschall Med 2012; 33: 151-157. Itoh A, Ueno E, Tohno E, Kamma H, Takahashi H, Shiina T, Matsumura T. Breast disease: clinical application of US elastography for diagnosis. Radiol 2006; 239: 341-350. Chang JM, Moon WK, Cho N, Kim SJ. Breast mass evaluation: factors influencing the quality of US elastography. Radiol 2011; 259: 59-64. Chang JM, Moon WK, Cho N, Yi A, Koo HR, Han W, Kim SJ. Clinical application of shear wave elastography (SWE) in the diagnosis of benign and malignant breast diseases. Breast Cancer Res Treat 2011; 129: 89-97. Athanasiou A, Tardivon A, Tanter M, Sigal-Zafrani B, Bercoff J, Deffieux T, Neuenschwander S. Breast lesions: quantitative elastography with supersonic shear imaging-preliminary results. Radiol 2010; 256: 297-303. Park CS, Lee JH, Yim HW, Kang BJ, Kim HS, Jung JI, Kim SH. Observer agreement using the ACR Breast Imaging Reporting and Data System (BI-RADS)-ultrasound. Korean J Radiol 2007; 8: 397-402. Aytekin S, Guder H, Goktay F, Yasar S, Aker F, Aksaray S. Pyoderma gangrenosum and necrotizing fasciitis-like opportunistic invasive cutaneous fungal infection. Int J Dermatol 2016; 55: 563-565. Yuan WH, Li AF, Hsu HC, Chou YH. Isolated panniculitis with vasculitis of the male breast suspicious for malignancy on CT and ultrasound: a case report and literature review. Springerplus 2014; 3: 642. Berg WA. Supplemental screening sonography in dense breasts. Radiol Clin North Am 2004; 42: 845-851. Corsetti V, Ferrari A, Ghirardi M, Bergonzini R, Bellarosa S, Angelini O, Ciatto S. Role of ultrasonography in detecting mammographically occult breast carcinoma in women with dense breasts. Radiol Med 2006; 111: 440-448. Houssami N, Irwig L, Simpson JM, McKessar M, Blome S, Noakes J. Sydney breast imaging accuracy study: Comparative sensitivity and specificity of mammography and sonography in young women with symptoms. Am J Roentgenol 2003; 180: 935-940. Burnside ES, Hall TJ, Sommer AM, Hesley GK, Sisney GA, Svensson WE, Hangiandreou NJ. Differentiating benign from malignant solid breast masses with US strain imaging. Radiol 2007; 245: 401-410. Evans A, Whelehan P, Thomson K, Brauer K, Jordan L, Purdie C, Thompson A. Differentiating benign from malignant solid breast masses: value of shear wave elastography according to lesion stiffness combined with greyscale ultrasound according to BI-RADS classification. Br J Cancer 2012; 107: 224-229. Berg WA, Cosgrove DO, Dore CJ, Schafer FK, Svensson WE, Hooley RJ. Shear-wave elastography improves the specificity of breast US: the BE1 multinational study of 939 masses. Radiol 2012; 262: 435-449. Evans A, Rauchhaus P, Whelehan P, Thomson K, Purdie CA, Jordan LB, Vinnicombe S. Does shear wave ultrasound independently predict axillary lymph node metastasis in women with invasive breast cancer? Breast Cancer Res Treat 2014; 143: 153-157. Xie J, Wu R, Xu HX, Yao MH, Xu G. Relationship between parameters from virtual touch tissue quantification (VTQ) imaging with clinicopathologic prognostic factors in women with invasive ductal breast cancer. Int J Clin Exp Pathol 2014; 7: 6644-6652. Youk JH, Gweon HM, Son EJ, Kim JA, Jeong J. Shear-wave elastography of invasive breast cancer: correlation between quantitative mean elasticity value and immunohistochemical profile. Breast Cancer Res Treat 2013; 138: 119-126. Lasko TA, Bhagwat JG, Zou KH, Ohno-Machado L. The use of receiver operating characteristic curves in biomedical informatics. J Biomed Inform 2005; 38: 404-415. Ogawa W, Nakaya G, Karasawa H. Fitting of ROC curves for continuous data by using correction of the mean and standard deviation. Nihon Hoshasen Gijutsu Gakkai Zasshi 2004; 60: 111-117. Liu D, Zhou XH. Semiparametric estimation of the covariate-specific ROC curve in presence of ignorable verification bias. Biometrics 2011; 67: 906-916. Yang JY, Dunker A, Liu JS, Qin X, Arabnia HR, Yang W, Yang M. Advances in translational bioinformatics facilitate revealing the landscape of complex disease mechanisms. BMC Bioinformatics 2014; 15. Yao W, Li Z, Graubard B I. Estimation of ROC curve with complex survey data. Stat Med 2015; 34: 1293-1303. Halligan S, Altman DG, Mallett S. Disadvantages of using the area under the receiver operating characteristic curve to assess imaging tests: a discussion and proposal for an alternative approach. Eur Radiol 2015; 25: 932-939. Kottas M, Kuss O, Zapf A. A modified Wald interval for the area under the ROC curve (AUC) in diagnostic case-control studies. BMC Med Res Methodol 2014; 14: 26.